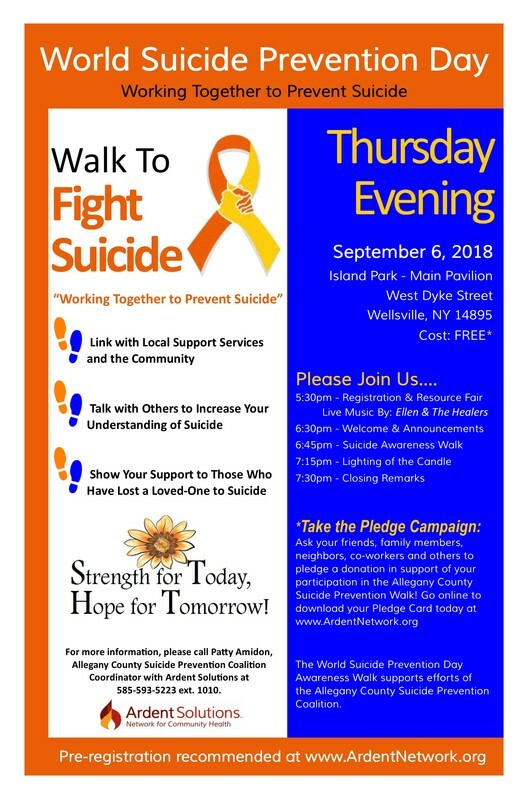 2018 Suicide Prevention Day: Awareness Walk - Ardent Solutions, Inc.
5:30pm - Registration, Resource Fair & Live Music by: "Ellen & The Healers"
Can't make the walk, but interested in supporting the Allegany County Suicide Prevention Coalition? 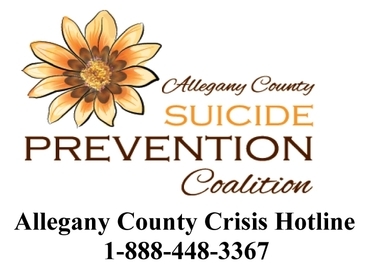 Make a Difference and Help Support the Allegany County Suicide Prevention Coalition by Taking the Pledge! 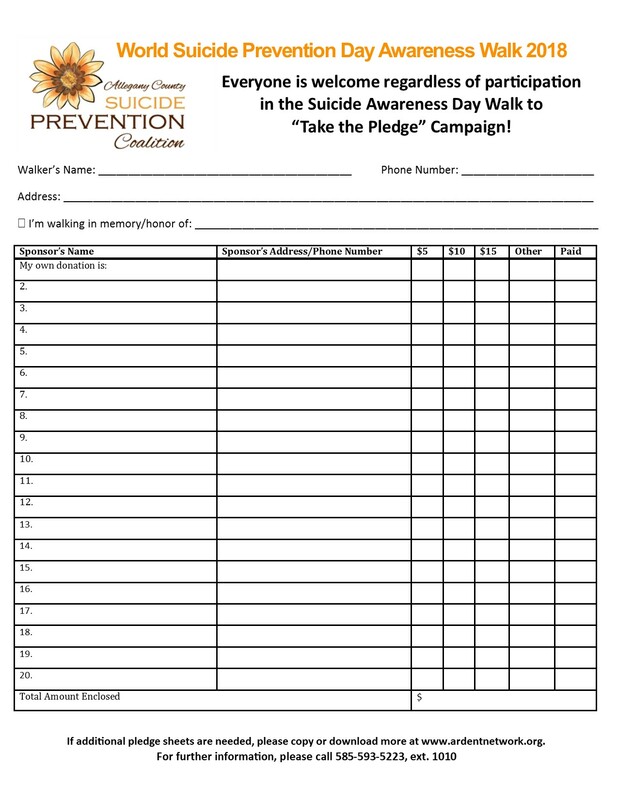 Take the Pledge to raise awareness about suicide risk factors and warning signs and help connect individuals with suicide prevention, intervention and postvention efforts. 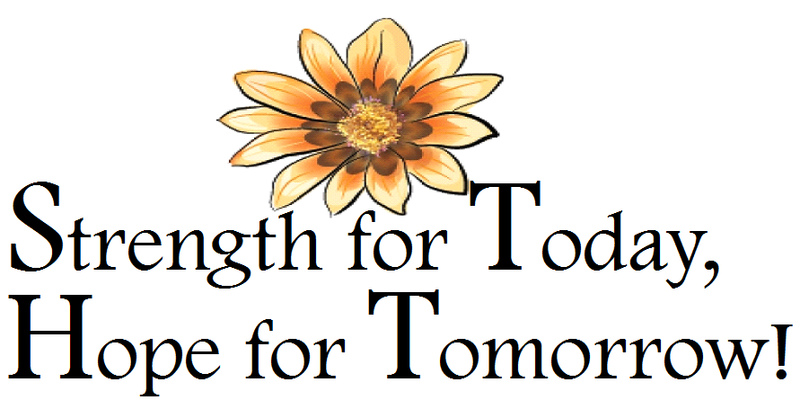 Monetary donations raised from Take the Pledge Campaign will support Suicide Prevention. Release and Waiver of Liability: In consideration for participating in the World Suicide Prevention Day Awareness Walk (“Walk”), I waive, release, and hold harmless Ardent Solutions and its, directors, officers, administrators, representatives, past and present employees, volunteers, agents, and supervisors, and also all participants, all city and state governments, all assigns, all sponsors, their representatives and successors and other persons (collectively, “Releases”) from any and all claims, liabilities, losses, demands, expenses, attorney fees, or causes of action arising out of an injury to me (or my child), and from any and all claims, liabilities, losses, demands, expense, attorney fees, or causes of action arising from my (or my child's) participation or attendance in the Walk. I assume all risks associated with participating or attending the Walk (including, but not limited to the risk of physical activity, collisions with other participants, falling, and any conditions of road surfaces). I assume complete responsibility for any injury or accident in which I (or my child) are a participant (and any resulting demands, expenses, and attorney fees) which may occur while traveling to or from the Walk, during the Walk, or while I (or my child) are on any premises related to the Walk. I agree to observe and obey all rules and safety procedures that accompany the Walk and to abide by any decision of a Walk official relative to my (or my child’s) ability to safely complete the Walk up to and including refusing participation in the Walk and returning the Walk registration entry. I am fully aware of the risks connected with participating in the Walk, whether specifically listed in this Release or not, and I voluntarily elect to participate in the Walk, or have my child participate in the Walk, knowing that participating involves these risks. I agree that the Releases are not responsible for any personal items or property lost or stolen or damaged before, during, or after the Walk. Please complete the following Registration Form. If a family, please include all participants on one registration form. For further information, please email Patty Amidon or phone at 585-593-5223, ext. 1010.